Using tiny plastic beads, University of Oregon biologists have captured new detail on how early embryonic cells in worms and mice orient themselves to establish their proper spatial arrangements and divide properly. Getting into position is vital for these cells in any lifeform as they build what will become an adult body. Researchers for years have viewed the motor protein dynein as the driver for orienting an embryonic cell’s spindle complex. Orientation determines the fate of the two daughter cells produced by every cell division. Recent studies, however, suggested something other than dynein was in play, said Bruce Bowerman of the UO’s Institute of Molecular Biology. His lab’s resulting study, published in the journal Developmental Cell, identified a mechanical cue that prompts another motor protein, myosin, to alter its normal duties to right the cellular ship by rotating the parent cell’s membrane to help guide the spindle into position. The cue is contact between cells, which was observed as the beads bumped into isolated embryonic cells. At left, a nematode embryonic cell (large, green circle) makes simple contact with another cell. At right, the embryonic cell bumps into an inert pink plastic bead. in both cases, just the contact causes the embryo to flop over as it is dividing. The long axis of the dividing embryonic cell rotates so its two daughter cells are parallel to the plane of the other cell or bead. The fundamental science discovery, seen at single-cell resolution in the earliest stage of embryogenesis, provides a new window into diseases such as microcephaly and multiple cancers that are tied to faulty cell division, said Bowerman, also a professor in the Department of Biology. He co-authored the paper with Kenji Sugioka, a former UO postdoctoral researcher who now is an assistant professor of zoology at the University of British Columbia. When cell division goes awry, newly spawned daughter cells fail to carry out their defined duties. For instance, Bowerman said, when stem cells don’t make neurons, the result can lead to microcephaly, a birth defect where a baby’s head and brain are smaller than expected. The defect has been seen in babies carried by women infected with the Zika virus. The research was primarily done in worms – the widely used research nematode Caenorhabditis elegans – but the work also was cross-checked in mice embryos. Most of the genes in the two organisms are conserved in humans and carry out similar processes. The discovery provides fresh insight into the routing of daughter cells in early development, Bowerman said. Knowing that dynein and myosin both can force the proper orientation of dividing cells with separate approaches potentially could lead to new targets for therapeutic drugs, he said. 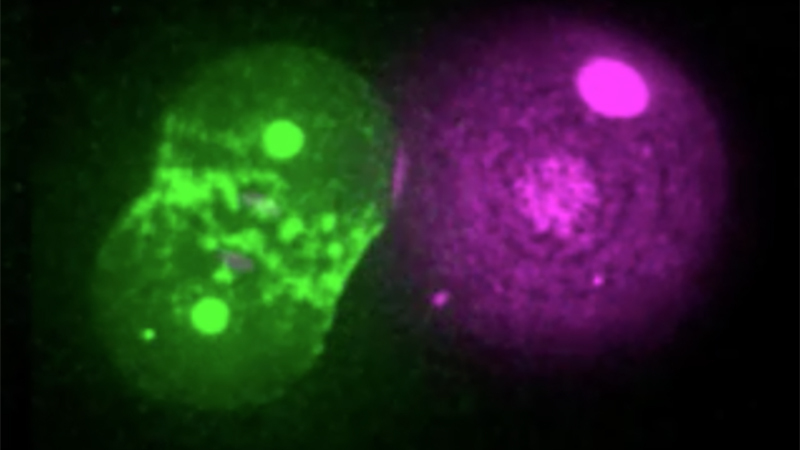 In later stages of development, some cellular contact does trigger cell-to-cell molecular signaling, involving Wnt genes, which also was included in the project, Bowerman said. The cell division process, he said, is reiterative and involves patterns of cell contact that may continually provide a code that serves to orient many different cell divisions during the construction of an organism’s anatomy.